THE mental anguish facing thousands of people across Northern Ireland can be seen in new figures obtained by The Detail which show that our hospital emergency departments dealt with 2,830 episodes of self-harm and/or people struggling with suicidal thoughts over one three-month period. Forty-one of the cases recorded between April 1 2012 and the end of June 2012 involved children aged under 15 – including 22 drugs overdoses and 11 children who had self-harmed with a sharp object. The Detail has been given rare access to information contained in the Northern Ireland Registry of Deliberate Self-Harm in response to a Freedom of Information request. The importance of the figures we are reporting on today is underlined by the fact that deliberate self-harm is seen as the most significant risk factor for future suicide – which already results in the death of around 300 people every year in Northern Ireland. The registry was jointly launched by former Health Minister Michael McGimpsey and his Republic of Ireland counterpart Mary Harney in October 2007 as part of all-Ireland co-operation on suicide prevention. The information held on the register includes each patient’s gender, age, and time of attendance and method(s) of self-harm. Individual people may have presented with self-harm on more than one occasion during the time period covered by our request. The Agency claimed that the data relating to whether or not patients were provided with a Card Before You Leave (CBYL) could not be released to us due to a “software reporting error”. CBYL provides a next day mental health follow-up service for patients who attend an emergency department with self-harm or thoughts of suicide and who have been identified as low risk to themselves or others. These patients should receive a card prior to discharge which gives details of their follow-up care and contact numbers for support. The registry also records whether or not patients saw a doctor and if they were given a psychiatric assessment – however this information has also been withheld from us by the Public Health Agency which claimed that releasing these details could result in individual patients being identified and might even lead to further episodes of self-harm. To read more on the withheld data, click here. This data has been withheld despite no identifiable client information being recorded or used in the registry. The NI Registry of Deliberate Self-Harm was initially piloted in 2007 at three hospital A&E units in the Western Trust area – Altnagelvin, Tyrone County and Erne – and later taken on by the Belfast Trust. Data has only been collated from every health trust since April 2012. Therefore, the figures we are reporting on today relate to the first Northern Ireland-wide collation of data on self-harm hospital attendances. However, they only give us a partial picture of a much wider problem as many self-harm incidents will not result in hospital treatment. If the number of self-harm attendances recorded during the first quarter of 2012 was repeated for the rest of the 2012/13 financial year – this would equate to a total of 11,300 presentations of self-harm and/or suicidal thoughts at our accident and emergency departments in a year. In 2010/11 over 4,820 people were admitted to our hospitals as a result of self-harm. The cost of their in-patient care alone was £2.7m. It has been estimated that around one in five people who attend an emergency department following self-harm will harm themselves again in the following year. A smaller percentage will repeatedly self-harm. The Royal College of Psychiatrists has stated that an act of self-harm is probably the most powerful single predictor of subsequent suicide. Sue Ramsey, chair of Stormont’s health committee, was one of many politicians to speak during an Assembly debate on suicide last month. She said the committee was concerned about whether there was a commitment across all departments to tackle suicide. She said that the last ministerial co-ordination group on suicide prevention meeting was held on 30 January and prior to this it had not met for 18 months. The next meeting is due to take place in August. The group has met only seven times since it was established in 2007. During the same debate, Health Minister Edwin Poots said the level of suicide in Northern Ireland is “unacceptably high”. We submitted a Freedom of Information request to the Public Health Agency (PHA) asking for information relating to each hospital presentation for self-harm since the start of April 2012. The information released to us covers only the first quarter of 2012 (April to June). We are still waiting for a decision to be taken on releasing the data to us relating to the second quarter of 2012. The data for each case provided in response to our request includes the self-harm methods used, the age range of the person involved in each incident, the number of drugs taken in the case of drugs overdose and two gender categories. The PHA has refused to reveal which gender is male and which is female, whether patients had a psychiatric assessment in A&E, if they were seen by a doctor or if they were admitted to a ward from A&E. We also do not know which patients were given the important Card Before You Leave. All of the missing codes and gaps in the data means that we cannot tell you if all of the 41 children aged under 15 were seen by a doctor before leaving the emergency department. Or if they were given details of follow up treatment if not admitted to a ward. We also do not know if one teenager aged between 15 and 19-years-old listed as presenting with a drugs overdose and self-harm with a sharp object was admitted to hospital. And we do not know what treatment was given to the person in their early 20s who arrived at accident and emergency after a self-harm episode which included jumping from a high place and drowning. Our analysis shows that there were 360 admissions for people who had suicidal thoughts but had not physically self-harmed. 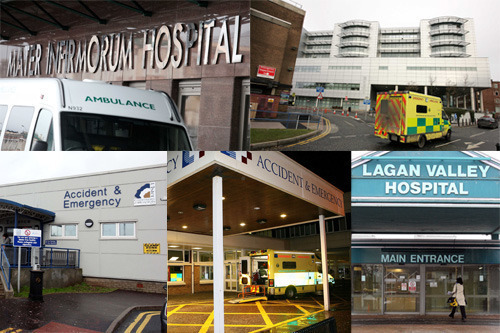 What action was taken by the hospitals in these cases which may be perceived as less urgent? There are only two codes used in the ‘Seen by’ column – 1 or 2. The PHA has told us that this field captures whether a patient was seen by A&E doctor/left without being seen by A&E doctor/unknown. Of the 2,830 total cases we have information on, 250 have the code ‘2’ in this column. Are we right to think that this is likely to mean 250 people – almost 9% – of the total who presented to A&E with self-harm or suicidal thoughts over a three month period left without seeing a doctor? If so, these cases include 62 cases of people who had harmed themselves with a sharp object – including a child aged under 15 – and 109 cases of people presenting at the emergency department with suicidal thoughts. We would like to be able to tell you if these people received a Card Before You Leave but unfortunately we cannot. The data we do have shows that hospital admissions for self-harm and/or suicidal thoughts are fairly evenly split across genders. However, we have not been told which gender category is male and which is female. Instead they have been coded ‘gender 1’ and ‘gender 2’. Knowing the gender of each case would have allowed us to work out if particular methods recorded for the first time by all hospital emergency departments were more common to males or females. We can calculate that almost 63% of the 415 self-harm/ideation admissions in the age group up to 19-years-old were gender 1 but this switches to gender 1 only making up 37% of the 716 admissions for people aged their 20s. Does this mean girls (or boys?) are more likely to self-harm as teenagers and less likely to continue this into their 20s? And what happens to the other gender category (boys or girls?) which makes them more likely to among those self-harming in their 20s than when they were younger? And what is the health service doing to address issues like these? The method of self-harm is recorded for each of the 2,830 incidents. In many individual cases, more than one method is listed. Twenty-two of the 41 cases involving children aged under 15-years-old included drugs overdose, 11 had self-harmed with a sharp object, six included the code for self poisoning by alcohol and nine of the young people had suicidal thoughts. One of the individual cases involving a young child is listed with three method codes – drugs overdose, suicidal thoughts and self-harm with a sharp object. Among the more unusual cases, there were four cases of intentional self-harm by adults by smoke/fire/flames and another four cases of intentional self-harm caused by crashing a car. The Public Health Agency carried out its own analysis of the data from the registry for the first quarter of 2012 – click on the link below to read this report in full. However, it is only two pages long and does not include any information on Card Before You Leave or any analysis of method by gender. It does not even tell us how many of the patients were seen by a doctor or how many were admitted to hospital wards from A&E. The PHA has also removed 764 ‘ideation’ (suicidal thoughts) cases from its analysis of key self-harm themes including the age of patients and the method used. As a result, it concludes that 1,707 individual people had presented with deliberate self-harm during the three month period. Our analysis of the self-harm database indicates that there were in fact 777 cases in total involving people presenting at hospital with suicidal thoughts from April to June 2012. This includes 417 individual cases with both the method code ‘85’ – unique to the Northern Ireland registry and relating to ideation – and also the World Health Organisation self-harm code for self-poisoning by alcohol (X65). We felt that it was important to include these 417 cases in our overall analysis of the self-harm data as they include physical self-harm by alcohol. Doing this means that our key findings are different to those put forward by the PHA which removed all ideation cases from its self-harm analysis. The PHA states that 73% of all of the deliberate self-harm cases presented during the first quarter of 2012 involved drugs overdose – our calculation (which included the 417 cases registered with both self-harm by alcohol and suicidal thoughts) puts this at a lower 61%. The PHA says that almost 51% of incidents had alcohol involvement – our analysis shows 59% of all self-harm cases (excluding suicidal thoughts only) included self-poisoning by alcohol. We found that 21% of the self-harm cases on the registry included the code for self-harm with a sharp object – the PHA puts this slightly lower at 18%. Looking at every single case listed on the registry’s database including cases where people had only suicidal thoughts, alcohol is involved in 52% of all presentations and drugs overdose in 53%. Suicidal thoughts were logged for 28% of all cases. The total number of all types of drugs ingested by patients is listed in the registry for the cases involving drugs overdose. The names of the drugs have been withheld. The data provided to us appears to show that the ‘number of drugs’ – which we assume to mean the number of tablets – taken by individual people ranges from two to 600. Of the 1,495 drug overdose cases, the “total known number of all types of drugs ingested by” 388 patients in the ‘totaldrugsqty’ column was listed as zero. We assume that the number in these cases was simply unknown. The average number taken by the others was 32. One person aged in their early 20s took five different drugs amounting to a total of 206 tablets. And a child aged under 15 arrived at the emergency department after taking 178 tablets and had also “self-poisoned” with alcohol. Looking at the age range of those presenting to A&E departments, the largest number were aged in their early 20s (20-24) with 403 presentations in the three month period. This was followed closely behind by 374 presentations in the 15 to 19-year-old age group. Professor Mike Tomlinson, from Queen’s University Belfast, examined death registration data over the last 40 years for a report on suicide published last year. He found that the highest suicide rate is for men aged 35-44, followed closely by the 25-34 and 45-54 age groups. His also said that suicide rates in Northern Ireland have doubled since the Good Friday Agreement in 1998. Unfortunately, the data released to us under FOI does not include information at an individual patient level on the Card Before You Leave Scheme. The scheme, which was officially launched in Northern Ireland in January 2010 by the then Health Minister Michael McGimpsey, was the idea of a group of parents and relatives from the Belfast Mental Health Rights Group (BMHRG) who had lost a loved one to suicide. They had conducted their own research and concluded that there was an important gap in service provision which they believed the scheme could address. The scheme was initially recommended in 2005 as part of an independent review into the death of young Belfast man Danny McCartan. CBYL is meant to provide a next day mental health follow-up service for patients who attend an emergency department with self harm or thoughts of suicide and who have been identified as low risk to themselves or others. They should receive a card prior to discharge which gives details of their follow-up care and contact numbers for support. The Health and Social Care Board carried out an evaluation of the Card Before You Leave Scheme using data from the period April 2011 to May 2012. See link to report below. The evaluation report was released publicly to journalists on April 25 – a day after we asked the Health and Social Care Board for a copy of the document. It is unclear why the evaluation – which we know was in final draft form at the end of August last year – took so long to be released into the public domain. The evaluation addressed concerns over high levels of non compliance with next day appointments and reports of inconsistencies in the application of CBYL in various emergency departments across Northern Ireland. The evaluation found that non-attendance at next day appointments remains an issue that requires attention. It also noted “residual implementation issues” with Child and Adolescent Mental Health services in “one particular trust”. :: 42% of those attending EDs with self harm/suicidal ideation were referred for urgent psychiatric assessment because of the high risk posed. The trusts “aspire” to provide such assessments within two hours of the referral so that no-one should have to wait more than six hours in total. :: Of those who required CBYL “almost everyone” was offered an appointment within 24 hours. :: Since the launch of the CBYL service, there have been concerns about the numbers of patients who do not attend (DNA) their appointments. The report states that “that there has been little change during the course of this monitoring period and this continues to be an issue that requires attention”. A previous draft of the report stated that the regional DNA rate had “steadily improved”, dropping from 29% in June 2011 to 20% in May 2012.This line appears to have been removed. :: 46% of patients who attend their CBYL appointment require further mental health appointments while 54% are discharged to the care of their GP. :: Alcohol and drug misuse needs to be taken into consideration within any initiatives aimed at reducing the incidence of suicidal ideation in Northern Ireland. :: The trusts should explore proposals for improving access to “quiet room space” within their emergency departments. The Health and Social Care Board said the evaluation shows that the majority of patients who attend hospital with self-harm or thoughts of suicide are seen by a specialist mental health practitioner before they leave hospital. 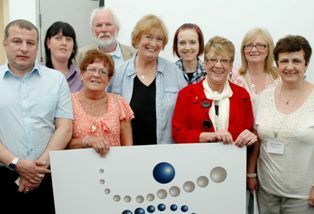 It added that the CBYL scheme is working well for patients who take up the offer of a next day appointment. After the evaluation of Card Before You Leave Scheme, which the Department of Health says was completed in December 2012, a decision was taken by the Health and Social Care Board to dissolve the CBYL Implementation Working Group. The 27 members of this working group included representatives from the health trusts and also members of the Participation and the Practice of Rights Project (PPR) in Belfast and the Patient & Client Council. The Belfast Mental Health Rights Group (BMHRG), which is supported by PPR, only heard in November that plans were underway to scrap the implementation group and that CBYL was subject to review. Despite meetings having taken place between the HSC Board and Belfast Mental Health Rights Group in the period between September and November, the plan to dissolve the implementation group was not disclosed during this time. Stephanie Green from PPR: “Involving people who have experience is not only the right and respectful thing to do but it also makes sense. A spokesperson for the Department of Health said: “The CBYL Project Implementation Working Group was put in place at the inception of the scheme to oversee its development, but was never intended to become a permanent part of the commissioning process. “Following the evaluation of the CBYL scheme, the HSCB agreed that from January 2013 the actions identified in the report to improve the future operation and effectiveness of the scheme will be progressed through the joint PHA and HSCB Self Harm Working Group, a subgroup of the Bamford Taskforce. “The members of the CBYL Implementation Group were advised of the changes to how the scheme was being overseen and of the dissolution of the CBYL Implementation Working Group after the evaluation of the scheme was completed in December 2012. “The HSCB completed an evaluation of the operation and effectiveness of the CBYL scheme in 2012. The showed that the scheme is fully in operation and well embedded across all trusts in Northern Ireland and is working well.